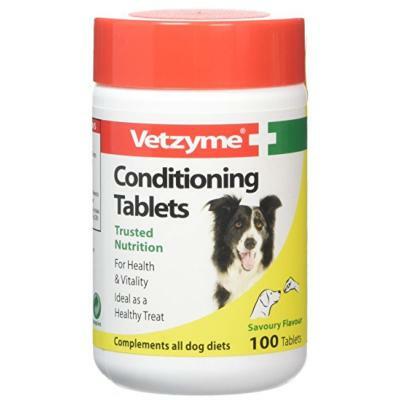 Engineered to improve health and vitality, Vetzyme Conditioning Tablets are an ideal supplement for puppies from 6 weeks of age and adult dogs. 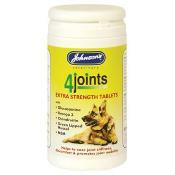 The tasty yeast based tablets contain a blend of vitamins and minerals designed to complement any diet. 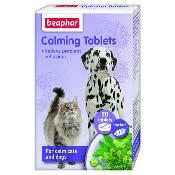 By providing a natural source of B-complex vitamins, regular dosing will help to protect dogs against nervous and anxious behaviours, poor coat quality and skin problems. B-complex vitamins are water soluble so can't be stored in the body to any great extent, so the tablets should be fed daily. The immune system can be supported and improved by proper supplementation, while the coat and skin remain healthy and vibrant. Typically 98%, Vetzyme Conditioning Tablets are safe to use in times of stress, pregnancy and illness. 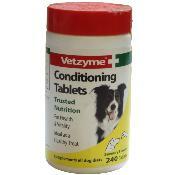 Directions: Vetzyme Conditioning Tablets can be fed as tasty treats or crushed and mixed with food.